Leaders of the UNT Students for Sensible Drug Policy created an Student Government Association bill advocating for changes in the academic consequences students may face from drug possession. The resolution calls for removing expulsion or loss of housing and meal plans as possible consequences for drug possession beyond marijuana and alcohol. The bill passed the senate and reached SGA President Muhammad Kara’s desk last Wednesday, where it was vetoed. Kara was contacted for an interview but canceled before time of publication. Applied anthropology graduate student Tristan Seikel, who is also president of the Students for Sensible Drug Policy, co-wrote the bill along with other members of his organization. Seikel said the consequences he faced after he was arrested for marijuana possession as a freshman were costly. Seikel was able to pay those costs with help from his family, but said that the bill aims to help those who are not as lucky or privileged, while relaxing consequence policies for different drugs. 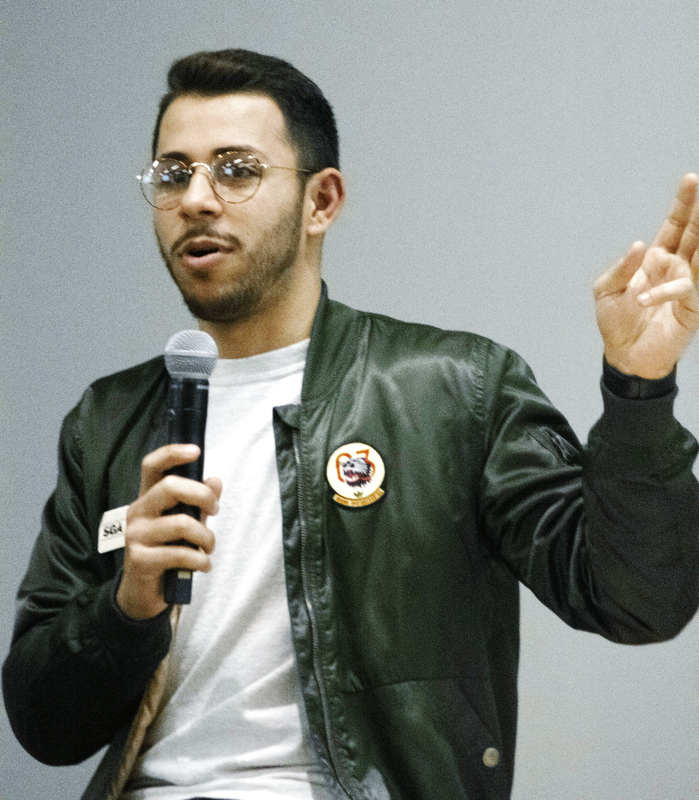 Current SGA president Muhammad Kara speaks at a meeting on Jan. 23, 2019. Image by: Ashley Gallegos. Seikel said his group plans to keep looking for avenues to change policy in spite of Kara’s veto, possibly through giving the resolution to the Graduate Student Council. 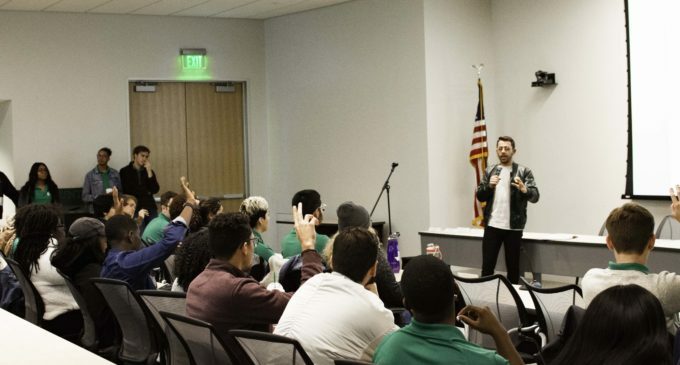 According to current UNT drug policies, first-time minor alcohol offenses and possession of marijuana under two ounces typically result in a warning, a yearlong probation and a referral to the Substance Use Resource and Education Center. Before 2017, any possession of marijuana would constitute higher penalties, according to UNT’s review of the Drug Free Schools and Communities Act, which requires colleges to establish rules regulating drug usage. Seikel said UNT changed its treatment of marijuana conform to cultural attitudes about the drug. The SURE Center, educates students who face drug problems at UNT. The center also processes students facing drug offenses for required counseling. SURE Center graduate assistant David Robinson said the program will not endorse any legislation or rule changes. Bill co-sponsor and SGA senator Shane Warren said his research with Seikel stands in opposition with stigmas about what substances cause more harm. Warren said that if UNT waits for drug acceptance to change before changing policy, the university will be “ruining lives” as other drug users face consequences. “Our drug policy in general is just not rational,” Warren said. Featured Image: Current SGA President Muhammad Kara addresses members of SGA at a meeting on Jan. 23, 2019. Image by: Ashley Gallegos. That’s the message this veto sends to students. What’s Kara’s problem? I take issue with that comment made by David Robinson because it seems to imply that alcohol generally can’t and doesn’t pose dangers to other people. As a representative of SURE, I thought the focus was now on harm reduction and evidence based education rather than perpetuating the lies of the Drug War that continue to thwart meaningful change for people/students who use drugs.